How this school has improved its campus and given students more responsibility through ScreenCloud. North Valley Baptist Schools is a very small K-12 private Christian school located in the Silicon Valley. The school is a ministry of North Valley Baptist Church and is open only to members of NVBC. The purpose of the school, since 1977, is to prepare young people for effective full-time Christian ministry. Create high-quality media that is in accordance with the school’s mission statement. Find a multi-use, affordable and flexible application to fulfil the school’s digital signage aims. 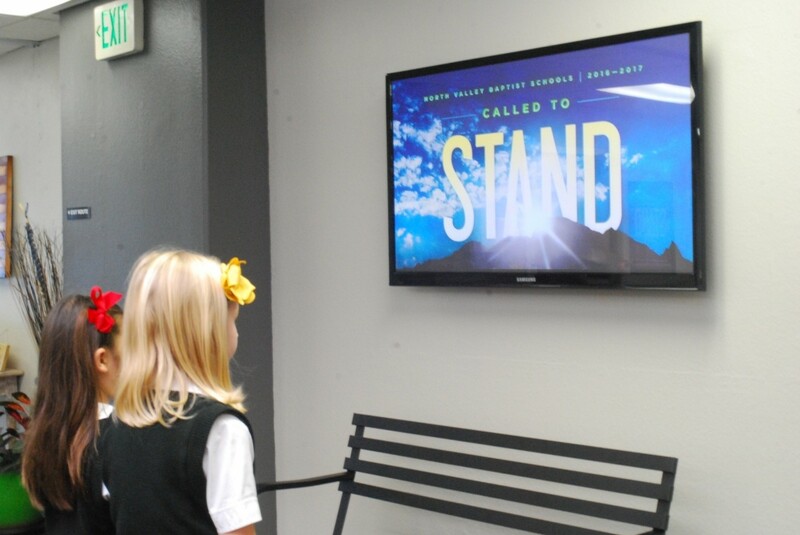 Begin using the digital signage framework already in place to inform, update and educate students and staff members. Leslee Hussin, Webmaster, Upper Level Math Teacher, Media Team Adviser & Yearbook Adviser at North Valley Baptist Schools, tells us how she found ScreenCloud and what she uses it for today. A few years ago, a generous family donated two HDTV screens to our school but before this school year, they were severely underutilized. In fact, one screen was installed at the front of our main auditorium but was never even turned on in the four years since it’s been installed. On the other screen, someone might have posted a generic photo gallery or two in the past few years, but otherwise, it was never turned on either. After shopping around for about a month or two, it became very clear that there was no way we could afford the “bigger names” in digital signage out there. We signed up for a few trial accounts, but nothing was very user-friendly. On many websites, it was unclear what application/program was being offered, the price of the digital signage, or if there was a trial account I could access right away. If anything, most sites pointed me to sales reps. As a very busy educator, I don’t have the luxury or the inclination to sit around and wait on a sales rep to get back to me, to schedule a video conference with one, and so on. Until we stumbled upon ScreenCloud! And I’m so glad. Both screens are Samsung HDTV’s. One screen is connected to a Windows 7-based computer (Intel NUC), and the other utilizes a Google Chromebit. We use ScreenCloud to inform both staff and students on campus of daily, weekly and upcoming events, to display announcements and reminders, to recognize student achievement, to display student photography and other digital projects, and to celebrate student & staff birthdays and milestones. I tell my media team (comprised of high school sophomores and juniors) that our goal is to inform and to educate the student body, and to enrich the quality of our school campus. At first, I thought, compared to other examples I’ve seen, that ScreenCloud was just a ‘glorified slideshow’ provider. I couldn’t have been more wrong. Google Slides, in particular, has been a lifesaver. It allows my entire media team to share their work with one another on Google’s platform, to collaborate, and make immediate changes to our content (announcements, reminders, photo galleries, etc.). Updating our digital signage using Google Slides couldn’t be any simpler. I’m also able to share Google documents with students without having to give them access to our ScreenCloud account. We create all of our material in-house, using PhotoShop, Google Slides, and various graphic and typography apps found on Apple’s App Store. It’s been a terrific way for my media students to learn graphic design skills and then be able to show off their handiwork in real-time. Their assignments are for the “real world,” and I’ve enjoyed seeing each student take careful, diligent ownership of our screens on campus. ScreenCloud, though "across the pond" from us, has been very prompt and professional in every communication we’ve had. Everyone I’ve been in contact with, from the CEO to the support staff, has only validated that we made the right choice to go with ScreenCloud as our school’s digital signage solution. As a small school, we appreciate the educational pricing offered. ScreenCloud is the best decision we’ve made. It’s been the ultimate affordable, attractive solution to digital signage. Our campus was recently renovated, and adding digital signage via ScreenCloud has just taken our campus to the next level in terms of aesthetics, communication, and professionalism. We already had everything in place - flatscreens and a fast, reliable Internet connection - but it took ScreenCloud to put it all together for us!